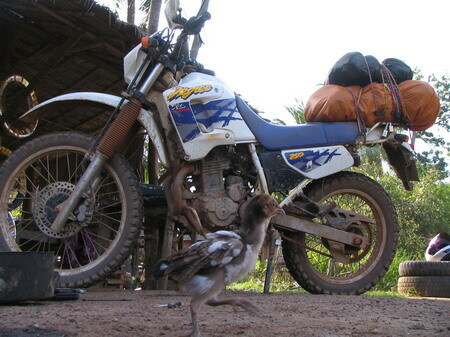 This is the first of three posts describing a 4 day Khmer New Year motorbike journey along the loop Phnom Penh, Kampong Chhnang, Kampong Thom, Preah Vihear, Stung Treng, Kratie, Kampong Cham, Prey Veng and back to Phnom Penh. 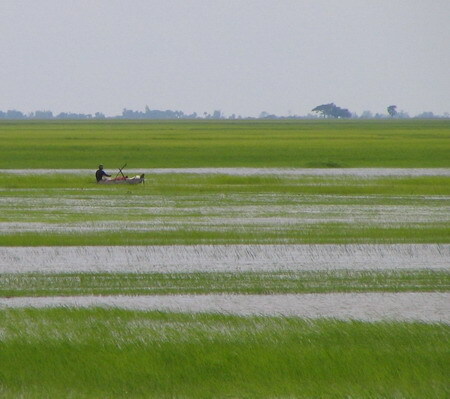 This post deals mainly with a ride through the dry flood plains of the Tonle Sap, the largest lake in Southeast Asia, between Kampong Chhnang and Kampong Thom. 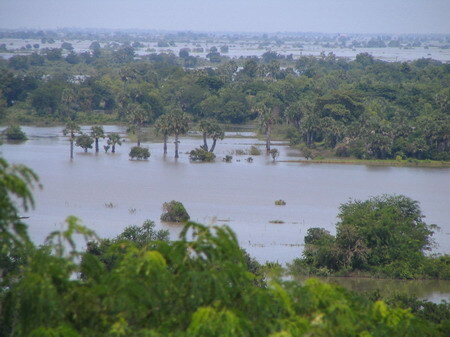 This is the plan: we ride the 92km from Phnom Penh to Kampong Chhnang already in the evening of Friday, planning to get up early the next day, cross the river with the ferry and ride through the flood plains to Kampong Thom. 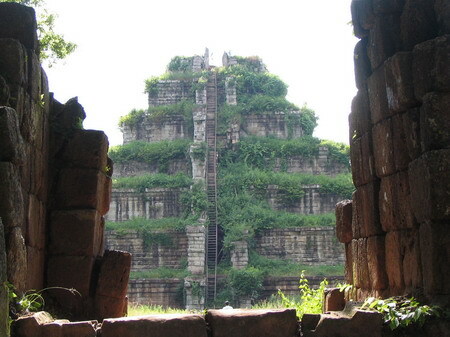 This trip is not mentioned in any of the guide books I use but I found a helpful account of it by Mac on Khmer 440. 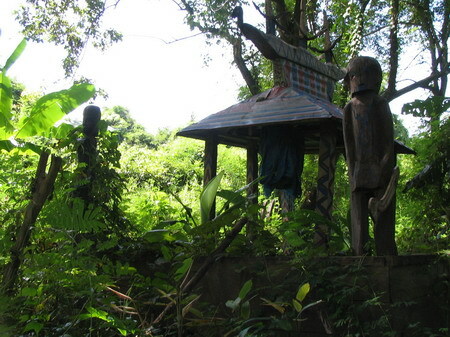 Without it, I would not have known that this trip is possible and it also has good clues as to how to do it. 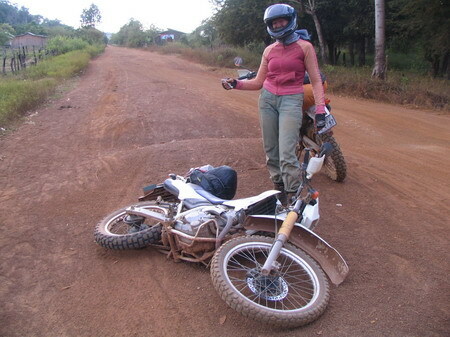 The plan for today is to ride from Sen Monorom in Mondulkiri all the way back to Phnom Penh. 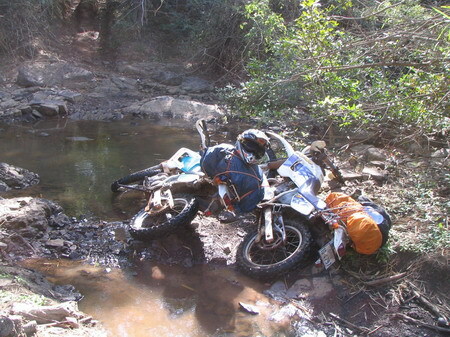 This is quite a ride in terms of distance but fortunately the road is in good condition. Most of it is paved, much of it recently. 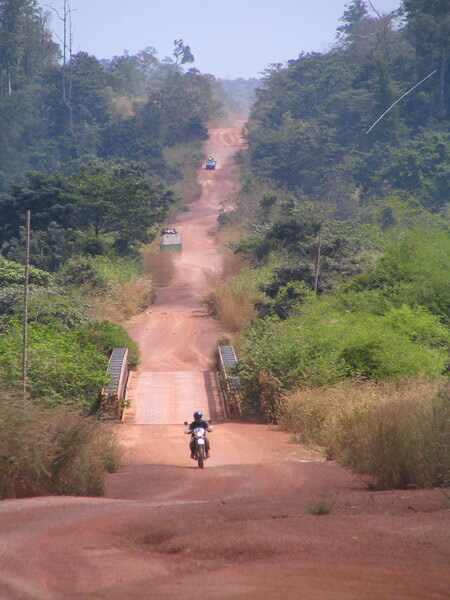 We plan on first traveling to Snuol on Provincial Road 76, a distance of 135km on decent dirt road. 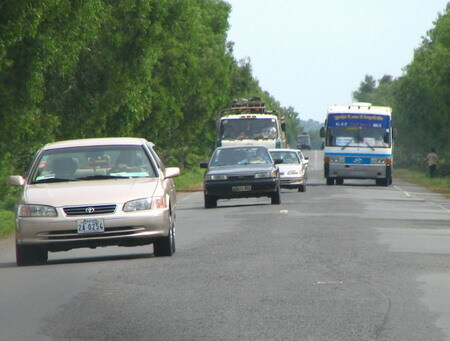 From Snuol we follow the recently upgraded National Road 7 through Memot towards Kampong Cham. 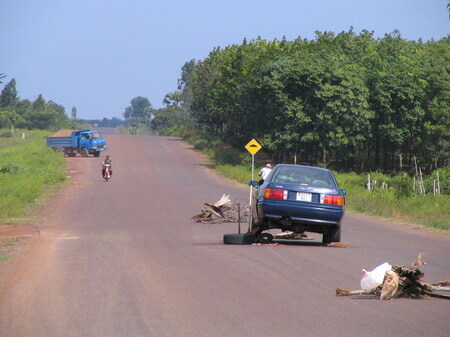 About 12km before reaching Kampong Cham we turn south right after we pass Chob and follow Provincial Road 11 through Prey Veng to Neak Luong (Neak Loeang, Neak Loeung), a distance of almost 100km on paved road with little traffic through rubber plantations. 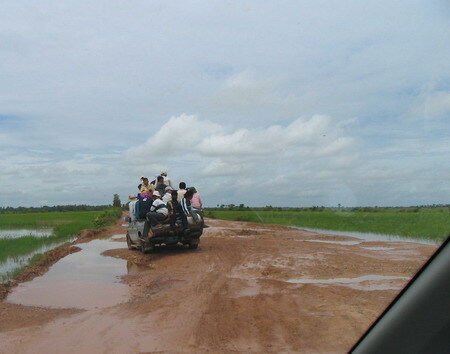 The route through Prey Veng is a moderate detour but due to little traffic and the bending road a much nicer ride than the alternative National Roads 6 and 7. Moreover, these roads tend to be terribly jammed in the evenings, particularly during holidays such as today. 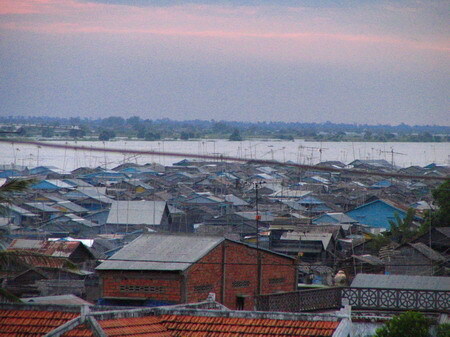 We cross the Mekong River in Neak Luong and head back to Phnom Penh on National Road 1. The plan for today is to ride from Kaoh Nheak to Sen Monorom, where we want to spend the next night before heading back to Phnom Penh. 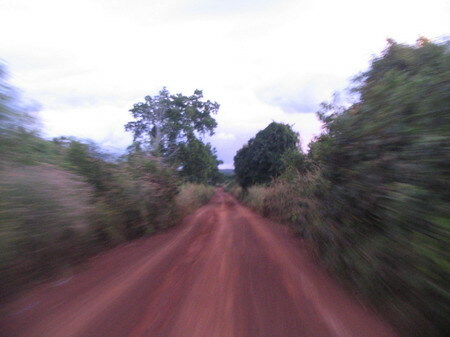 This is the second part of our trip from Rattanakiri to Mondulkiri through forest and mountains. We get up fairly early and have breakfast, before we hit the trail again. I have been looking forward to this part of the trip for a long time. 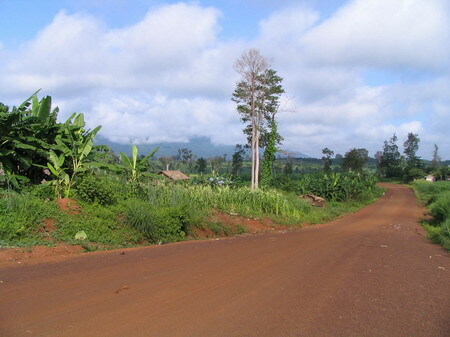 During the next two days we attempt to travel from Banlung (Ban Lung) in Rattanakiri to Sen Monorom in Mondulkiri, straight through forest and mountains. 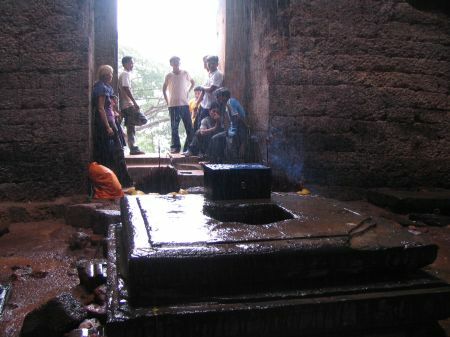 This trip is considered one of the most exciting in Cambodia. 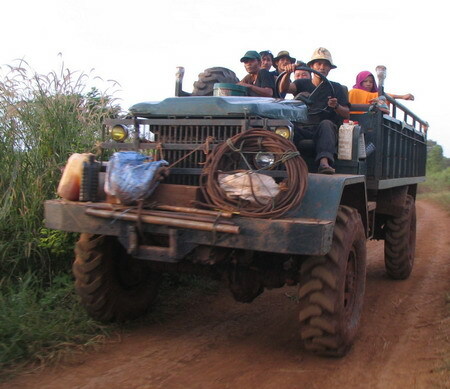 The authors of the Adventure Cambodia guide book have dedicated a whole 6-pages section to it, entitled “The Death Highway” (their account is posted further down on this page). This title may be a bit exaggerated but they did it (the other way around) during the wet season and ended up doing much of the journey with broken dirt bikes on oxcarts and tattered Russian jeeps. 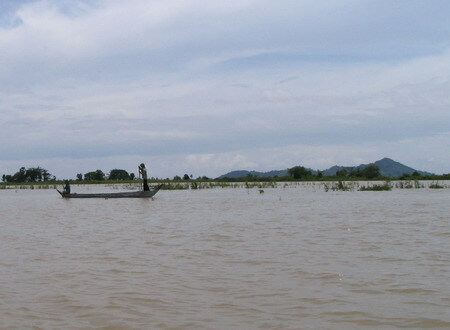 We plan to spend the night in Kaoh Nhek, a village about half way to Sen Monorum. Tomorrow we continue to Sen Monorum. 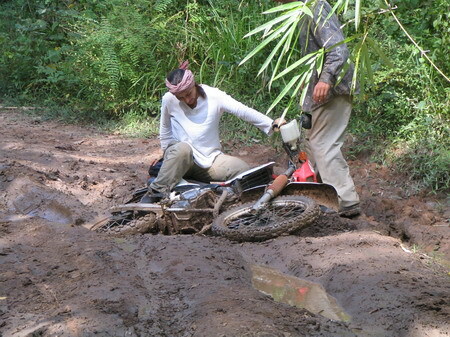 What thrills me is that we don’t have any spare clutch lever or front tube left before even getting into the rough part of the trip. The plan for today is to again go on a trip with great guides Lim and Lot, this time on a loop from Banlung to the east and south. 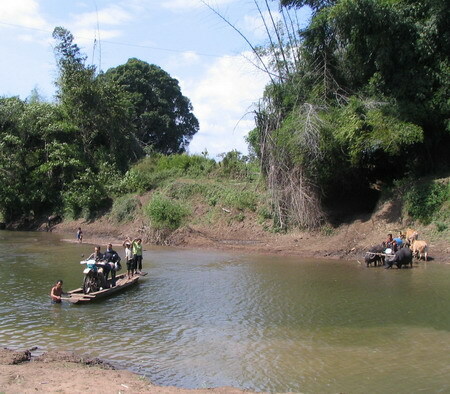 We travel by motorbike and visit Ou’Sean Lair Waterfall and the Bokeo mines in the Ou Ya Dav area (hope I got it right). 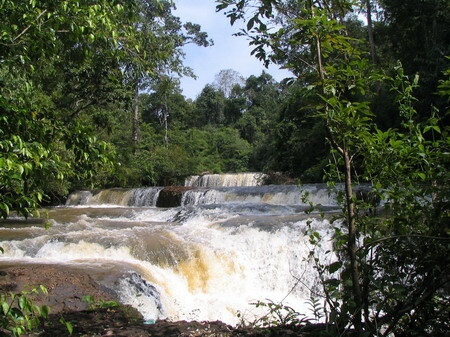 If you require a guide in Rattanakiri just call Lim: 012517418. 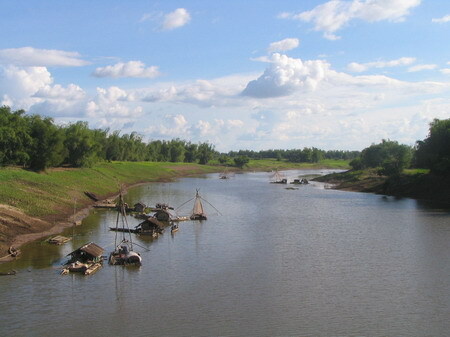 The plan for today is ride to ride on motos from Banlung to Voen Sai at the edge of Virachey National Park (Virochey, Virachay), which is about 35km northwest from here at the banks of the Tonle San River. 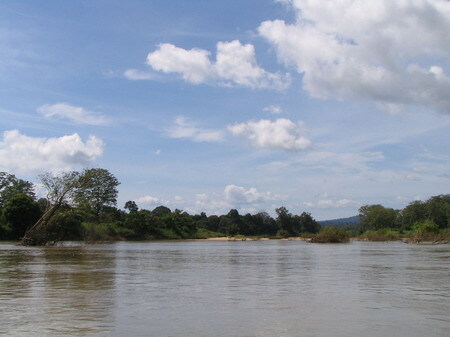 From there we will take a boat and follow the San River to the east to Ta Veang (Taveng, Taveaeng), taking in a Tompuon cemetary at Kachon village on the way. 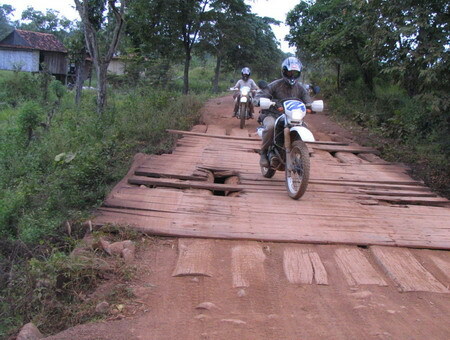 In Ta Veang we change transportation again and return to Banlung by moto. 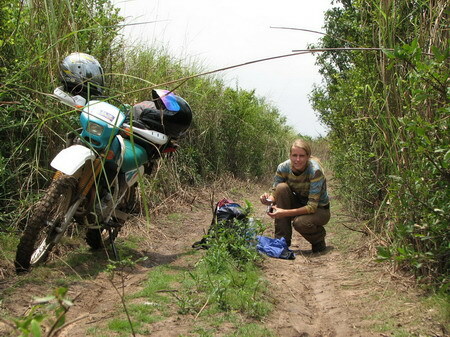 We travel with Lim and Loth, two great and capable chaps we met during our working days in Banlung. 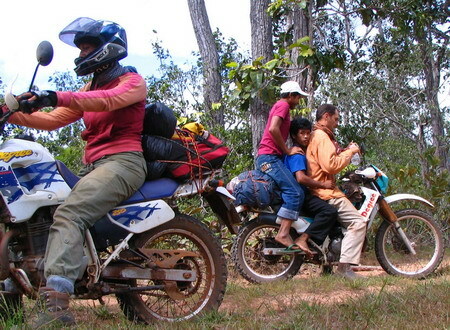 Lim and Lot work part time as guides in and around Rattanakiri. Today is a holiday, more precisely: Pchum Ben Day (Bonn Phchum Ben, P’chum Ben, Bonn Pchom Ben). 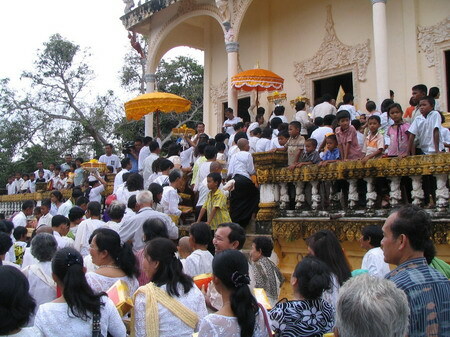 It is on the occasion of this holiday that Cambodian Buddhists pay respect to the dead through celebrations and offerings that take place at wats. 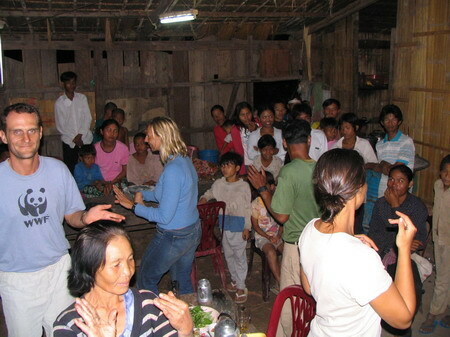 The plan for today is to join one such celebration in a wat in Svay Rieng Province with my colleagues. 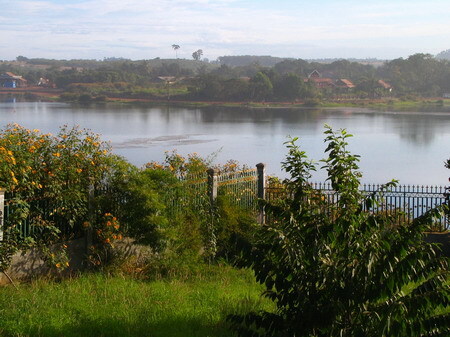 We drive all the way to the Vietnamese border, visit the border crossing at Bavet (Moc Bai) and have a look at the casinos that have sprung up on the Cambodian side of the border. 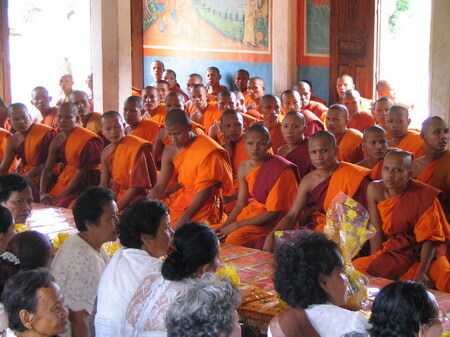 After that we join the Pchum Ben ceremony at a wat not far from the border. Visiting casinos and paying respect to the dead on the same trip seems an odd combination yet Cambodians have a great capacity to accommodate contrasts, tensions and contradictions. It is time for an extended weekend trip again. The plan is to ride from Phnom Penh to Kampong Thom today and meet up with Vothear and Sokhom, two friends of mine who are excellent guides for exploring the temples in Kampong Thom, Preah Vihear and Siem Reap. 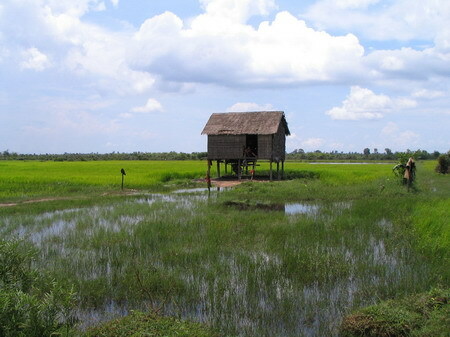 The plan for tomorrow is to follow National Road 6 towards Siem Reap town for another 100 km or so, passing Stoung and Kouk Thlok Kraom on the way until we reach Dam Daek. From here, we follow the newly upgraded Road 66 to the north for about 30 km, until we reach Prasat Trapeang Noem, close to Beng Mealea (Boeng Mealea), an ancient temple. 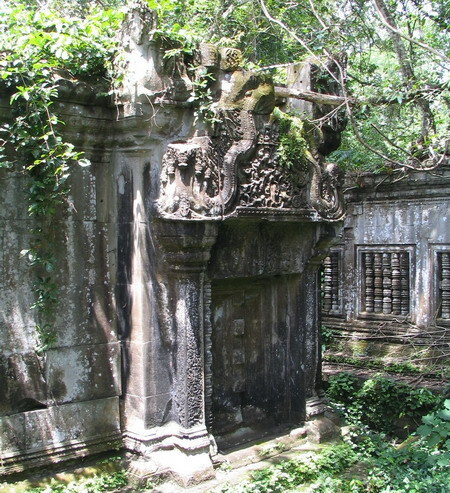 After visiting the temple we plan to proceed on what is a new road towards the northeast until via Svay Leu to Prasat Kor Ker (Kaoh Kerr, Chok Gargyar, Phnum Dai), another ancient temple, or rather, a complex of dozens of them. 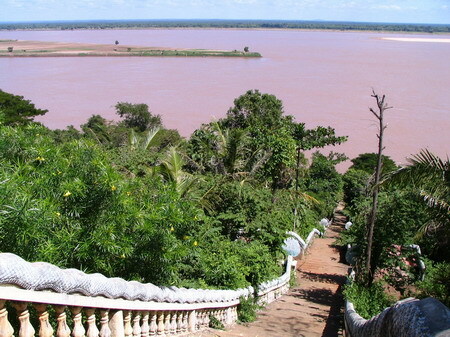 From here we continue on a more modest road and via an extensive detour through Trayang to Kulen (Koulen) and finally to Tbaeng Mean Chey (T’beng Meanchey), the provincial capital of Preah Vihear province, where we spend the night. 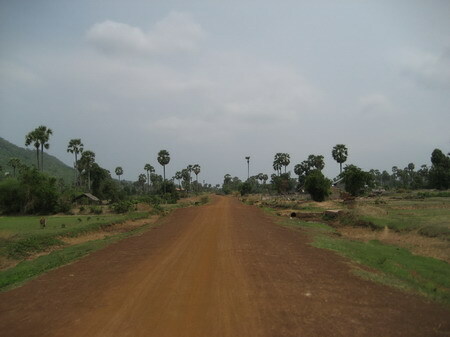 The next day we return to Kampong Thom on Road 64 and from there I continue home to Phnom Penh. 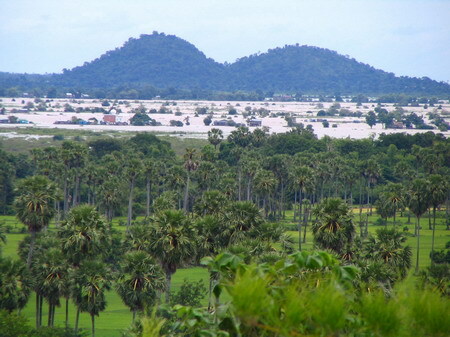 The northeast of Cambodia is the place to visit at the moment: itâ€™s seriously green, strangely volcanic and noticeably cooler than the rest of the country. Cambodiaâ€™s Minister of Tourism H.E Lay Prahos is very excited about the areaâ€™s increasing potentialâ€”an area attracting more and more tourists. 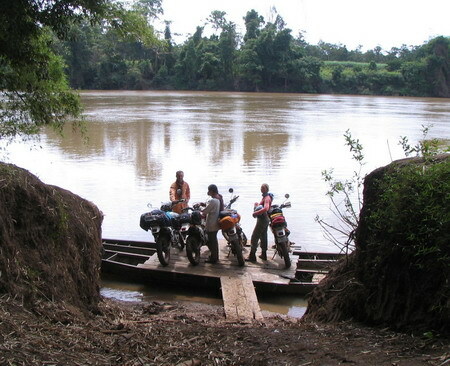 We take the motorbike to reach Takeo town and head to the riverside to find a boat. 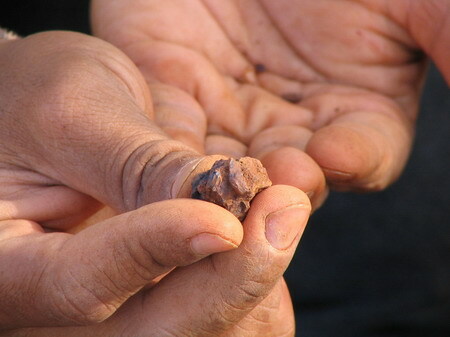 We don’t have to look for long to find one and to agree with the driver on the price (US$ 25 for the round trip). 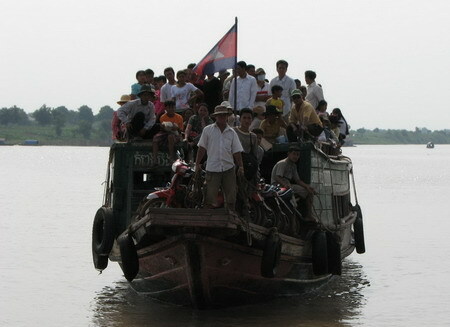 Two Khmer passengers join the ride on the fast boat to Angkor Borei.